Encouraging kids & adults to read more and for them to learn more science is one of our priorities. Free ebook copy of a BIO-Sapien Novel will be available to all customers. A young man by the name of Jaden is abducted by benevolent aliens, bio-engineered to superhuman levels and sent back to Earth years later to stop an alien invasion. 150,000 years ago Darclonians began on an experimental dark energy/dark matter weapon that works only with carbon based life forms. The organic subject would eventually die. 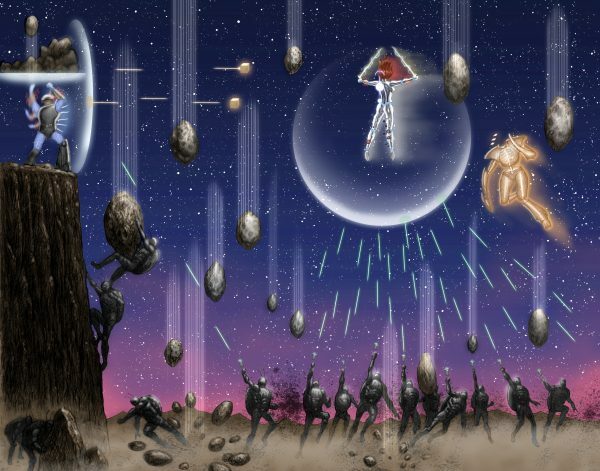 100,000 years ago Darclonian probes sought out thousands of planets with life on them that could develop into intelligent life forms. The probes fired Quadrillions of Nanomoles into Earth’s atmosphere seeking intelligent life. The Nanomoles hid inside of the modern Homosapien brain and studied humans for thousands of years. The Nanomoles recorded our feelings, memories, emotions, experiences and DNA from generation to generation. Today the Nanomoles await a signal from a Darclonian mothership to begin it’s 84 hour three stage countdown. Jaden’s bio-engineered body is the key to perfecting the Darclonian’s weapon of mass destruction. Jaden becomes a super hero unlike anything ever created before. The rebirth of science fiction begins. “…there are A LOT of scenes that the reader gets to experience. From the military battle with the UFO, to the alien shark attack on another planet (which is really cool, by the way), this author offers a never-ending parade of amazing creatures and locations that will, perhaps, one day be logged into popular literary culture right beside old C3PO and his little beeping buddy…. …There are two factions out there in America – Star Wars vs. Star Trek – and I am definitely on the side of George Lucas having the more creative concept. So hats off to this writer, Vlane Carter, who may someday join those Lucas ranks if readers and sci-fi fans everywhere band together and realize that the force really MAY be with this one.” -FEATHERED QUILL REVIEWS.